He’s the Hollywood star who feels more at home in Paris, and the devoted dad who looks like a teen pin-up. He’s utterly bonkers, and eminently bonkable. He’s Johnny Depp. The girls in the office were swooning with excitement. “You're going to interview Johnny Depp! Can I come with you and hold the microphone?” Join the queue, I told them, behind my flatmate, his boyfriend, everyone at the dinner party I went to last week—they all want to hold the mike for Johnny. Hold Johnny's “mike” more like. Everyone wants him, but on the day, he keeps us all waiting. He presented an award the night before to Romanian folk group Taraf de Haidouks (Band of Outlaws) at the Radio 3 World Music Awards (they played Depp's Gypsy family in Chocolat) and he seems to be having a little lie in, pushing the interview schedule back 20 minutes. “Jet lag,” he explains apologetically when he finally arrives after being “groomed” for the television footage he'll shoot after our interview. 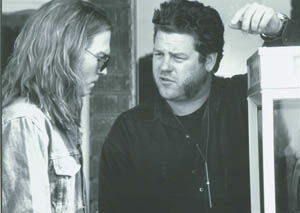 Although he only came from France to do this publicity round for From Hell, his latest movie, he's still recovering from a recent trip out to Los Angeles for the funeral of his friend Ted Demme, the director of Blow, in which Depp starred. “A fallen comrade,” he describes him. How was the funeral? “Devastating.” Depp shakes his head sadly. At 38, Demme was the same age as Depp is now. He'll be 39 this June. He looks 10 or 15 years younger than that, with his hair long and (groomed or not groomed) boyish, soft stubble. In memoriam, Depp is wearing a T-shirt with a picture of Demme on it. Sartorially, he's big on tributes. He's also wearing a necklace with that famous stylised portrait of Che Guevara, and a ski hat that says “The Viper Room,” in honour of the LA club he owns where River Phoenix died from an overdose. More permanently, he has “Betty Sue,” his mother's name, tattooed on his body. He used to have “Winona Forever” tattooed somewhere else in honour of his then girlfriend Winona Ryder. Apparently it now just reads “Wino” after surgical treatment. [Editor’s Note: The tattoo reads “Wino Forever.”] The guy's a walking billboard for the people and things he loves. He's serious about acting though, and reportedly researches roles assiduously. Mind you, research for From Hell couldn't have been too much of a chore because he's always been fascinated by true crime stories, especially the Jack the Ripper one. Does he think people identify him too much with characters like From Hell's Abberline? Does he think viewers see him lying there, smoking opium, and jump to conclusions? Indeed, he's very mellow at the moment because he hasn't got another project lined up. “I've been on a break for a long time. I haven't worked since I shot Once Upon A Time in Mexico in June. And before that, it was the Don Quixote movie with Terry Gilliam [which was to have Paradis as co-star]. That started up really well and then ground to a really nasty halt. We started shooting and the lead actor, [Jean] Rochefort, who was playing Quixote, had some sort of back weirdness and then got sick. He's no spring chicken, Jean, but he's very virile and alive. But he's pushing 70 and he had to be on a horse all the time, so coupled with the back and the injury and stuff like that the whole movie evaporated. “It was going to be a great movie, too, we [Terry Gilliam and Depp] have talked about reviving it. It was going to be like a ‘best of’ Terry Gilliam, he was like going, diving in. Before that it was From Hell. So I've been unemployed for quite a while. It's nice,” he grins. Once Upon A Time in Mexico was directed by Robert Rodriguez (El Mariachi, Desperado, Spy Kids) and is yet another of Rodriguez's tributes to the westerns of Sergio Leone. Depp clearly had a blast making it. “It was great, man. Really great,” he enthuses. “Rodriguez is really a good guy, a really fun guy. We shot it in high def, which isn't even video, it's like digital something, digital miracle! It was incredible! Robert was just shooting this stuff and you'd never hear ‘Cut!’ You'd just keep doing this scene until he said, ‘Do it again.' You never hear ‘Reload!’—it was amazing. You're basically working off a tape that's 75 minutes long, so you can just go. You could do the whole film on one tape. “Rodriguez is amazing, an interesting guy. He's going to be around for a long time.” The longevity mention sounds like he's thinking, a little sadly perhaps, of his fallen comrade Demme. 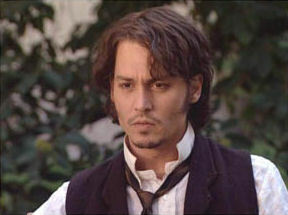 And before I know it, the TV people are here and impatient, and my time with the nice Mr. Depp is up. Again he apologises. “I feel bad now, everyone's getting penalised for my tardiness,” he says, and to make up for it he lets me take a snapshot of him with my super-cheap, super-crappy digital camera—and then wants to know the make and how much it cost. I sense that he really is contrite, and at the same time he's too mellow to stress about it.